Students Learn About the Moon! of lunar material. Descriptions of the samples were discussed. Students created a model of the surface of the moon. Students worked together to classify different types of moon rocks. A digital microscope was used to get a closer look at the lunar disk. CHS Graduates Outscore State and National Averages Again on the ACT! Note: THESE ARE NOT THE STATE TESTING RESULTS FOR JUNIORS. states like Nebraska, where 100% of graduates take the ACT, will have a lower overall average. So, this is the first year that all graduating seniors at Chadron High School took the ACT test due to the new State testing requirements that began when these graduates were juniors. Here's a summary of our data with comparisons to trends from past years. narrowly trailed Wisconsin which held the highest average of 20.5.
institutions nationwide to show student readiness for college-level coursework. A special thanks to all of our teachers and students for their efforts!!! Check out Mrs. Gregory's classroom blog. Mrs. Gregory is in her first year teaching Physical Science and Chemistry at Chadron High School. Yes, I know it’s been a while. Trying to balance blogging about my class with planning for my class and grading for my class and cleaning up after my class is…. formidable! However, my physical science kiddos just completed a super neat project and I would feel like I’m short handing parents if I don’t tell you about it. Physical science just completed a unit about types of substances, matter, and materials. I wanted to break of the monotony of typical, 40-point unit tests so I threw in alternative assessment. The focus of this assessment has been water: what materials pollute water and what materials can clean water. The kids kicked off the assessment with 30 (that’s right, 30!) whole minutes of writing about global water crises. The students researched what materials pollute water, what countries face the most debilitating water crises, and solutions to the global water crisis. I’m a huge writing nerd so reading about the kids’ research has been a joy for me. The next part of this assessment was a Google Science Fair project called Dirty Campers. In this project, students designed a water filter that would provide water clean enough to bathe in using a variety of materials including activated charcoal, sand, filter netting, cotton balls, and kitty litter. The waste water for filtering came from the drainage ditch in front of the school. I don’t think the kids have ever really looked at the water before based on the disgusted looks on their faces. After a test-run, students modified their design to make more effective filters. While not every student obtained crystal-clear water, all kiddos learned a little bit about the materials that can remedy water pollution. Below are some pictures from the experiment and recaps of the experiment written by students. From top, left to right: the materials, the wastewater, some initial designs, first round of filtered water collected, some reworked designs, second round of filtered water collected. “In this experiment, we all made a filtration system using various materials and dirty water. What I did is gather cotton, sand, soil, pasta, and activated charcoal to proceed with constructing two different filters. The first time we got better results than the second. I can infer that charcoal does a good job of filtering water. In conclusion, I probably would never use this filter system.” -Brinnley H.
“We put in three cotton balls and 20 mL of sand, and potting soil. Ours worked the first time because the filter cleaned the water.” – Brianna L.
“We filtered 100 mL of dirty water. We could use a coffee filter, sand, soil, activated charcoal, cotton balls, and a netted filter. We used sand, soil, cotton balls, and a netted filter. Ours worked but would have worked better if we used more materials. -Dawson D.
“Throughout the world, water crises is a major problem. In physical science, we planned, designed, and tested our own water filters. We used a recycled plastic bottle, a rubber band, cotton balls, sand, activated charcoal, a net, pasta, and cat litter. Our group then poured 100 mL of dirty water into our filter. Even though we only got 50 mL of water back, our water was clean and has a pH of 7. All in all, our water filter worked well and it showed me that there are easy ways for places with no clean water to filter their water.” -Leila T.
Chadron High School’s Student Council has been preparing for 2018 Homecoming since the beginning of the school year. Now that the celebration is right around the corner, they are excited to announce what festivities will occur during the week of October 9th through the 12th! With no school on Monday, October 8th, the Homecoming activities will begin on Tuesday, October 9th. Throughout the week, there will be a daily dress-up theme that gives students and staff the opportunity to show their Cardinal Pride. This year, Student Council will give out several Best Dressed prizes. Then, the group will choose the ultimate winner, who will be admitted into the Homecoming dance free of charge. TUESDAY (Oct. 9): Decade Day. Students and staff are encouraged to wear clothes from one of their favorite decades (50s, 60s, 70s, 80s, etc.). Students will wear as much of their color as possible and try to dominate the school. THURSDAY (Oct. 11): Meme/Vine Day. Students and teachers are challenged to recreate one of their favorite videos or posts on social media. FRIDAY (Oct. 12): The dress-up theme is of course...SPIRIT DAY!!! Everyone is encouraged to wear Cardinal gear and colors to show their school spirit. The last day of Homecoming, Friday, will be filled with many other exciting festivities! First, the pep rally will be held in the High School Gym at 2:00. 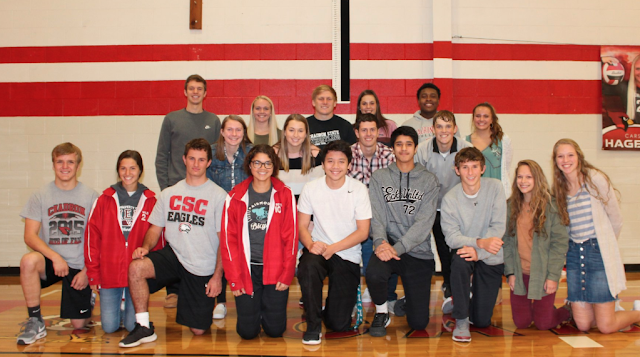 Student Council has planned fun games for the annual fall sports competition, the CHS dance team will also perform, and the Cardinal Mascot will make a special appearance. Next, the Homecoming football game vs. Mitchell will be held at 7:00 pm. At half time, the Dance Team will perform and Homecoming royalty will be crowned. We look forward to homecoming week and hope you plan on attending as many activities as possible! Parents: Help Stop Teenage Vaping and Juuling! Parents: We're hearing about an increase in student use of vaping products including Juul which looks like a USB device and comes in flavors including mint, mango, fruit medley and creme brulee. I'm sharing the following video and information for your awareness of these products. I hope you will take the time to be on the look-out for these dangerously addictive products. The flavored e-cigarettes with their trendy devices are luring teenagers into nicotine addiction without smoking a cigarette. The powerful dose of nicotine found in these products makes them extremely addictive. Chadron Public Schools defines e-cigarettes as any vapor products or alternative nicotine products. Use or possession of any vapor product or alternative nicotine product is prohibited and will result in student suspension. We want to remind our families that there will be No School on Wednesday, October 3rd due to district inservice. Classes will resume at their normal times on Thursday.